You will earn 5,868 Reward Points. Earn 1 reward point for every 1 dollar spent. 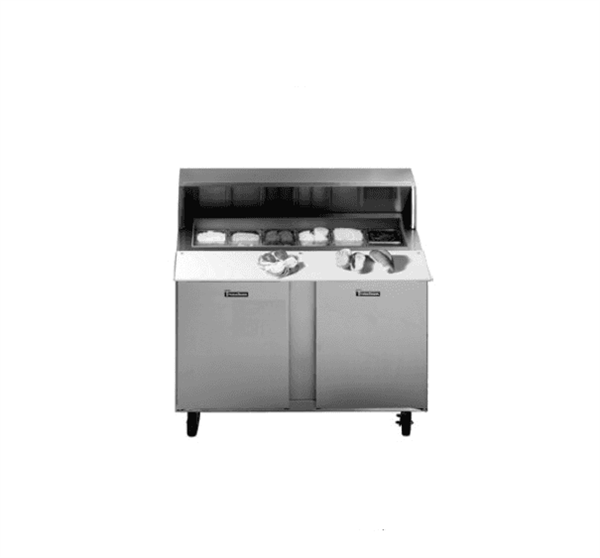 Traulsen's durable, high performance, sandwich prep tables provide a high quality/ high value alternative to the all too common commodity types in today's market. Any comparison between prep tables should start with performance, and Traulsen really does the job. Not only do they all meet the NSF 7 Standard, but do so under real world conditions, even when using 6" deep pans! A Traulsen exclusive. Truly front breathing, their design allows for "zero-clearance" installation. As a result they can be placed right up against the backwall and alongside other kitchen equipment, saving valuable floor space. Cabinet exterior front, sides, pan cover, lid and doors are constructed of stainless steel. Cabinet interior and door liners are constructed of anodized aluminum. The exterior cabinet back and bottom are constructed of galvanized steel. Doors self close at less than 90 degrees and also includes a stay open feature at 105 degrees. Easily removable for cleaning, vinyl magnetic door gasket assures tight door seal. Both the cabinet and doors are insulated with an average of 2" thick high density, non-CFC, foamed in place polyurethane. A 3/4" thick, full-length, reversible white nylon cutting board is supplied standard. Each model is supplied standard with its full compliment of 4" deep plastic 1/6 size pans and stainless steel pan dividers. The pan cover and lid are constructed of stainless steel, and is easily removable for cleaning. A balanced, rear mounted, front breathing, self-contained refrigeration system using R-134a refrigerant is provided. It features a capillary tube metering device, air-cooled hermetic compressor, a forced air evaporator coil and a non-electric condensate evaporator. An 8' cord and plug is provided. Standard operating temperature of the refrigerated base is 34 to 38°F. Standard interior arrangements include two (2) powder coated wire shelves per door, mounted on pilasters. These are adjustable in 1/2" increments, allowing for a minimum of 1-1/2" spacing between shelves. Both a three year parts and labor warranty and a five year compressor warranty (self-contained models only) are provided standard.